I'm really sorry that I forgot to announce that Birdie Brown is sponsoring this month's Copic/Promarker Challenges at The Outlawz. You need to sign in or sign up for The Outlawz for the challenge details. But you should do so to check out the gorgeous cards that the DT created using my digis! Here is a card that Carla, one of the DT, made using Stacking Gift Boxes. 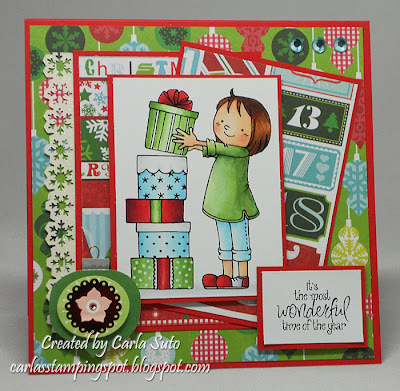 They will be showing us cards/projects using Birdie Brown's digis each week in December. Head on over to The Owtlawz site right now so that you won't miss a chance to win a prize! The Winner of November Freebie Challenge!